It is clear that, by the early 18th Century, the type of dog known as the "Setter" had come into its own right. It is also clear the Irish had begun actively breeding their own type. For example, the de Freyne family of French Park began keeping detailed stud records in 1793. Other prominent landed Irish gentry also known to have been breeding setter lines at the same time include Lord Clancarty, Lord Dillon, and the Marquis of Waterford. It was noted as early as 1845 that Setters in Ireland were predominantly either red, or, according to Youatt, "...very red, or red and white, or lemon coloured, or white patched with deep chestnut." 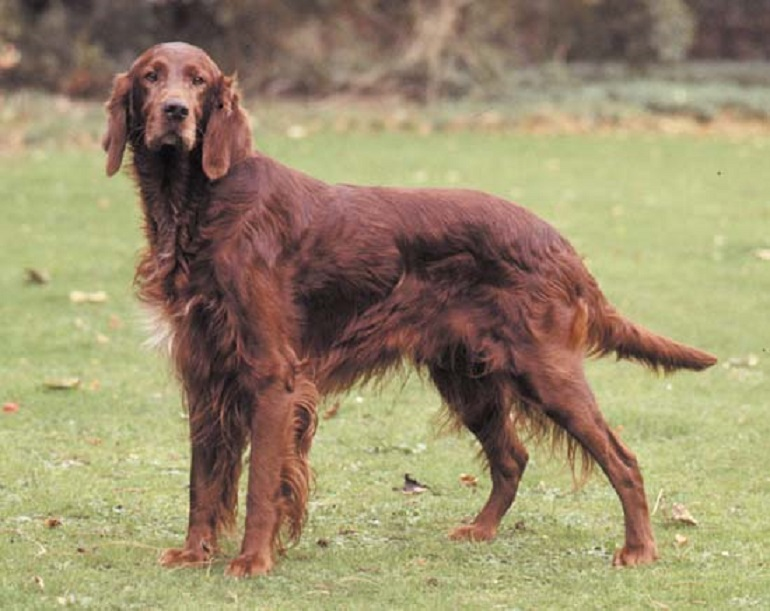 Clearly, the preference for a solidly-coloured dog was having an effect on the appearance of the typical Irish-bred setter. The Breed Standard for the modern Irish Setter was first drawn up by the Irish Red Setter Club in Dublin and approved on 29 March 1886. It consisted of a 100-point scale, with a given number of points awarded for each of the dog's physical attributes. The points system was later dropped; however, aside from some minor changes, the Standard remains largely unchanged today in most countries where the breed is formally recognised.